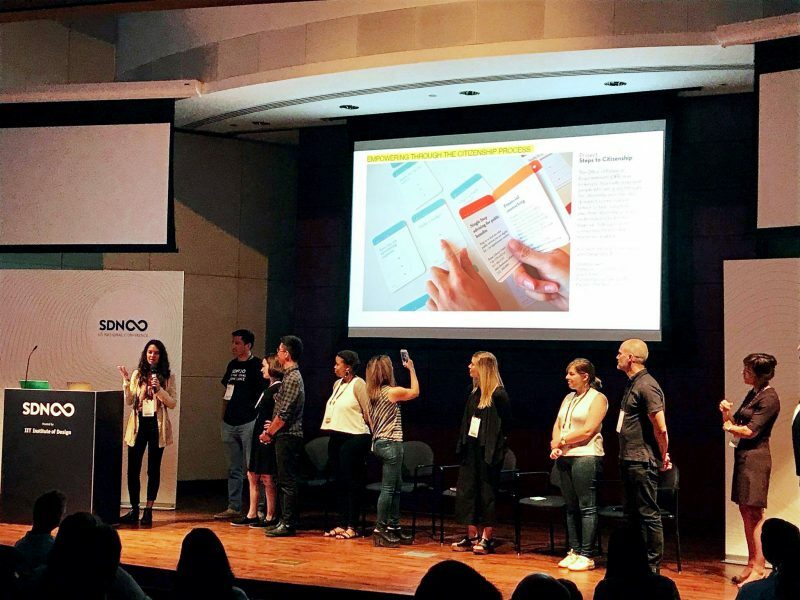 Transd recent graduates win first prize for their project ‘Steps to Citizenship’ and third prize for project ‘Reimagining Civic Education’, in the first National US Service Design Network Conference! 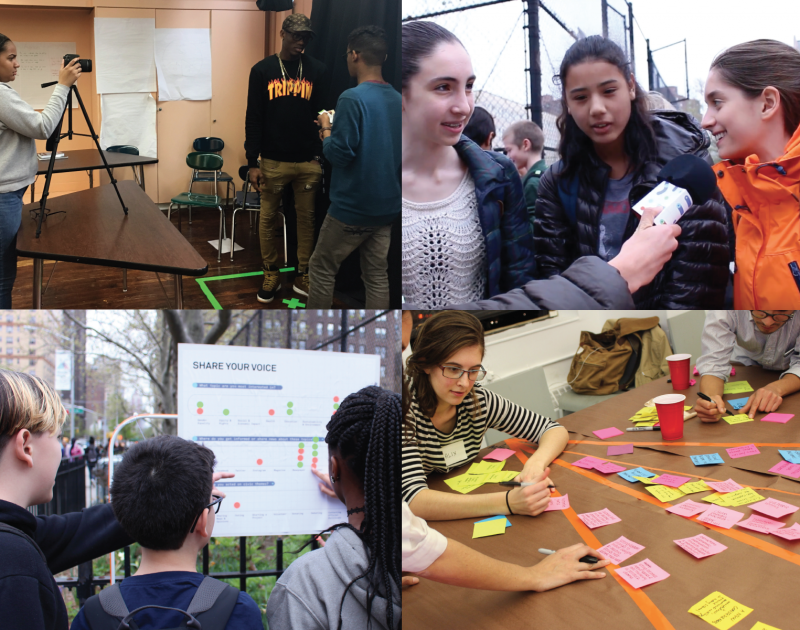 For ‘Steps to citizenship’, recent graduate Valentina Branada with Transd alumni Alix Gerber and Chengcheng Teng focused on empowering new NYC citizens with financial skills. 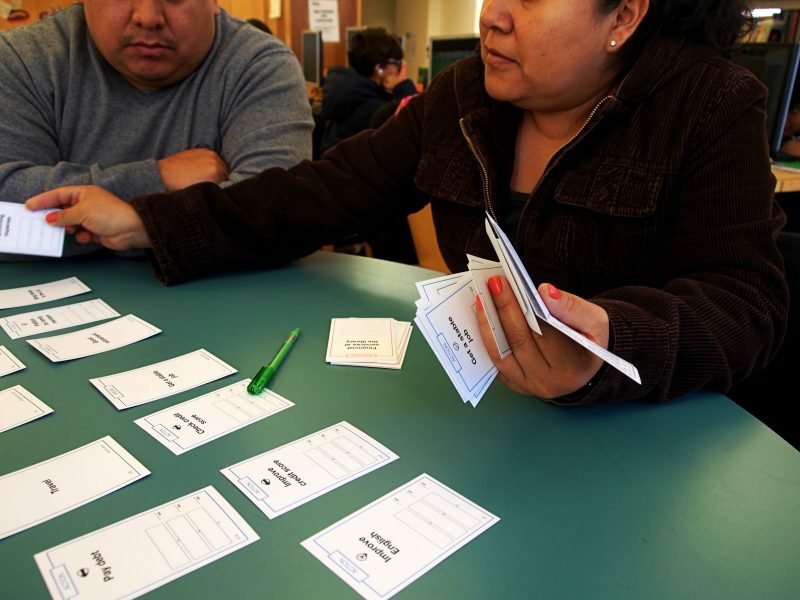 Using a card system to enable both financial counselors and legal advisors to guide applicants in creating a personalized plan towards citizenship, and learning financial skills along the way. 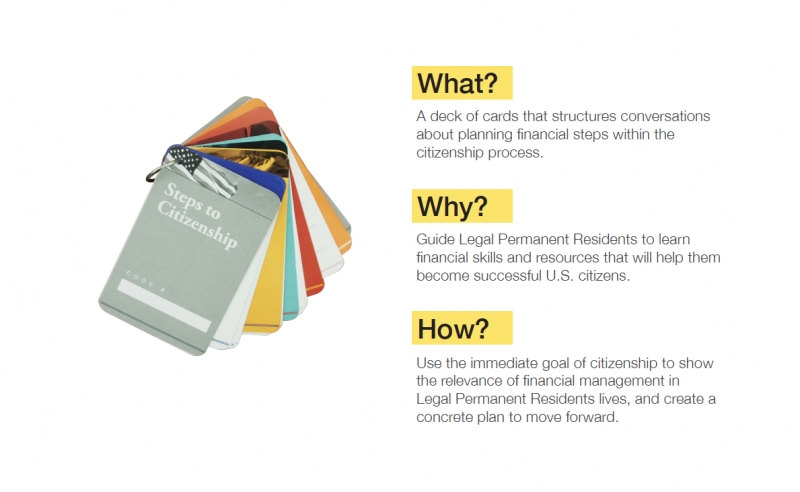 The final version of the card deck simplifies the citizenship application process by dividing it in three elements: preparing the application itself, planning for the fee payment, and preparing for the citizenship interview. 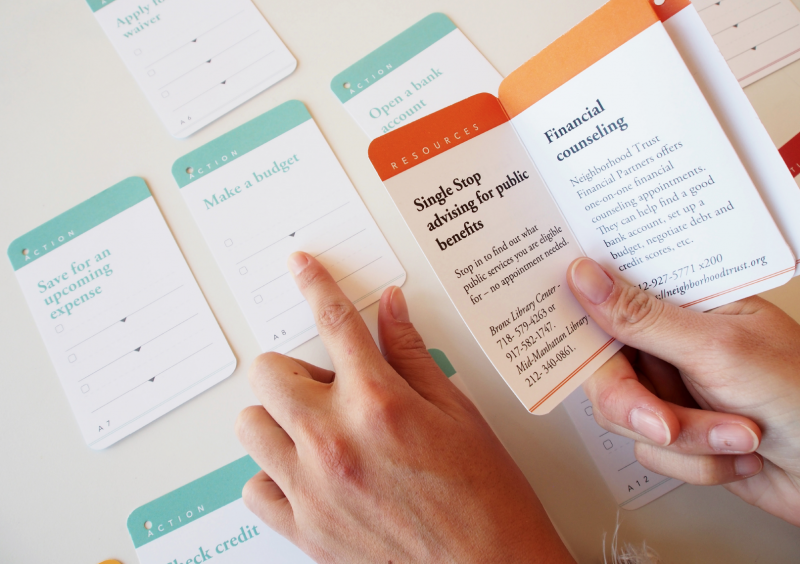 During a card reading session, advisors would begin by framing the conversation around the applicants dreams and motivations to become citizens, and then would present the steps of the process, asking questions and discussing where applicants felt they needed to focus along the way. Applicants could write specific steps forward that are relevant to them. Throughout the conversation, the resources card can be used to discuss local services to engage in each step. 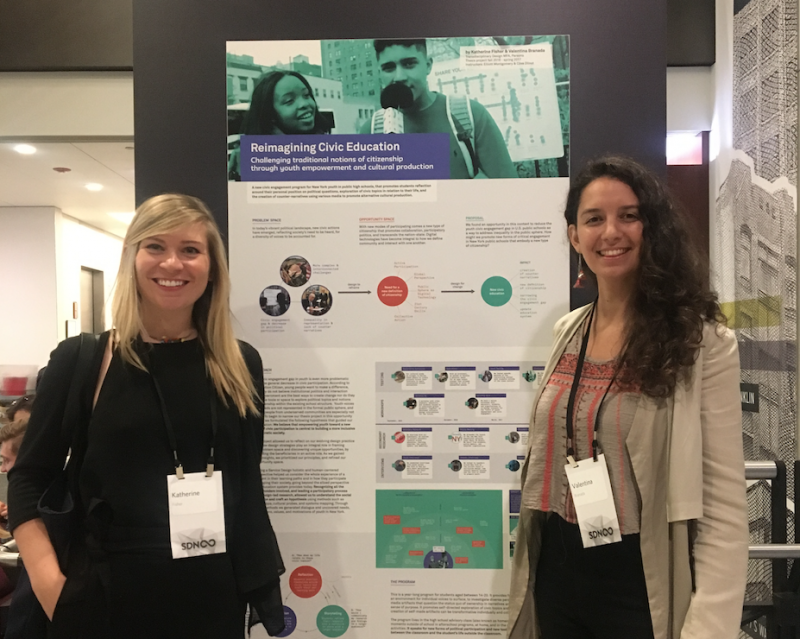 For ‘Reimagining Civic Education’, Valentina and Kate Fisher focused on challenging traditional notions of citizenship through youth empowerment and cultural production. They found an opportunity to reduce the youth civic engagement gap in U.S. public schools as a way to address inequality in the public sphere and asked; How might we promote new forms of critical engagement in New York public schools that embody a new type of citizenship? The proposed new civic engagement program for high schools, promotes students reflection around their personal position on political questions, exploration of civic topics in relation to their life, and the creation of counter-narratives using various media to promote alternative cultural production. The program speaks for new forms of political participation and new tools to bridge learning between the classroom and the student’s life outside the classroom. It provides frameworks and tools for student’s to go through a self-directed process of reflection, exploration, and storytelling, to share youth’s voices and create an individual and collective sense of purpose.